A Zimbabwe journalist is currently holed up in Ouagadougou, the Burkinabe capital, after a coup this week forced an abrupt closure of airports and other exit points from the strife torn country. Willie Mponda (pictured with a vendor in the strife torn Burkina Faso capital), editor with the Gweru-based Sun newspaper, was in the West African country to attend a workshop, this week, on freedom of expression alongside 24 other African journalists. But the organisers were forced to call the meeting off after the nation was plunged into fresh turmoil which saw leaders of its interim government taken hostage by troops loyal to its ousted President Blaise Compaore. Compaore was deposed in a popular uprising nearly a year ago. “Gunfire and smoke is everywhere. All the shops are closed. 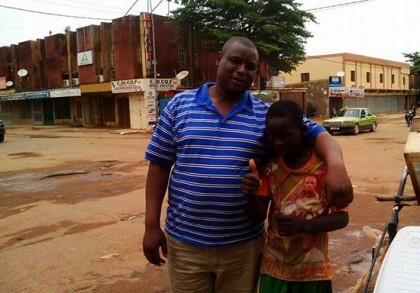 The situation here is not right at all,” Mponda narrated his ordeal from Ouagadougou on Friday. Authorities also imposed a curfew which saw some catering staff at the journalist’s hotel failing to report for work as usual in a volatile situation that has seen at least 10 anti-coup protesters gunned down. “The military claims there is a curfew from 7pm to 6am but the truth is the curfew is 24 hours as the presidential guards are firing at ordinary people during the day,” said Mponda affectionately known by Gweru journalists as 'Blango' (Big brother). “Only a few staff members are here but the airports and exit points are closed; we don't know when they will be opened. As if this was not enough trouble for the scribe, Mponda and fellow journalists attending the abortive media conference had their passports seized by police as authorities pulled all stops to try and contain the deteriorating security situation. Mponda could not readily tell if the authorities were doing the same to other foreigners in the country. Police, said the journalist, had promised to return their passports the day they were flying back to their countries. Mponda says he was receiving some assistance from a Zimbabwean legislator back home who has managed to link him up with some of her Burkinabe connects and the Zimbabwean ambassador to Senegal “who is checking on me regularly”. There is no Zimbabwean embassy in Burkina Faso. The situation was a nasty anniversary experience for the senior scribe who was supposed to celebrate his birthday on the plane while flying back home this Saturday. It could be not readily verified from the Foreign Affairs ministry if there could be more Zimbabweans in the former French colony facing the same predicament. Mponda is however, not the first local who has found himself stranded in a burning foreign capital. A few years ago, football star Edward Sadomba, plying his trade in Libya, once found himself marooned in Tripoli which has been engulfed in a bitter civil war since the ouster of its long serving leader Muammar Gaddafi 2011.